Here is a seemingly gentle story that actually explores parental depression and the intensity of pre-teen friendships, as well as family secrets. It could happily sit beside the novels from the likes of Cathy Cassidy; what makes this one special is the brooding atmosphere of secrets waiting to be discovered, which builds like a gathering summer storm. Becky moves with her mum back to the village where her mum grew up. 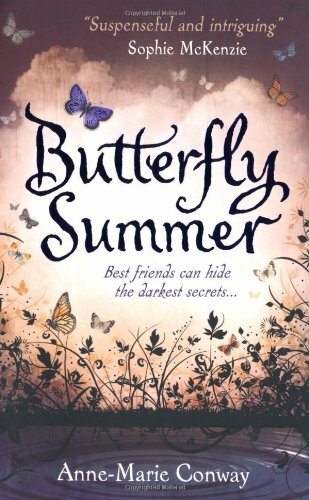 Left largely to her own devices over the summer holidays, Becky discovers a local butterfly garden where she meets another girl her age, Rosa May. An intense friendship develops and Becky is soon spending as much time as she can with her spirited new friend. But questions creep into her new life and mysteries surface and deepen. Becky discovers a picture of her mother with a baby who is definitely not her. A local man claims to have known Becky and her now absent dad, though she’s always believed they’d never been there before. Rosa begins to get jealous of Becky spending time with anyone else, especially local boy Mack who is helping Becky get over her near inexplicable fear of water by giving her swimming lessons. Answers are not easy – Becky dare not risk upsetting her mother, who is slipping further into depression the longer they spend in village, and she is afraid of what might happen if she picks at the tangled thread of her family history. You really feel for neglected Becky who is continually left on her own and has to go through her own challenging re-evaluation of what she believes and who to trust. Revelations delve into ghostly territory and are well-handled (although possibly not a surprise for some readers); the intrigue is spot-on for younger readers and delivered through pitch-perfect drama and prose. The portrayal of easy and of dominating types of friendships is especially evocative and should resonate strongly with the readership.